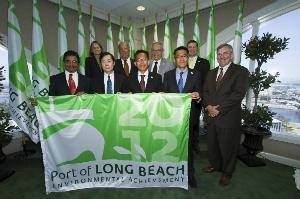 The Port of Long Beach's Green Flag and Green Ship annual awards honored 20 shipping lines for efforts to improve air quality. Efforts to improve air quality locally were accomplished by slowing ships down or deploying cleaner vessels, or both. These programs offer financial incentives. Green Flag participants were awarded $2.5 million in dockage fee discounts in 2012. And since the Green Ship Program began in July 2012, the Port has awarded $135,000 in incentives. • Mitsui OSK Lines, or MOL, Ltd.
• Tesoro - Gold Star Maritime Co.
• Wan Hai Lines (America) Ltd.
• NAVIG8 Group Holdings Inc.
• OSG Ship Management (GR) Ltd.